12 Years in a Row! 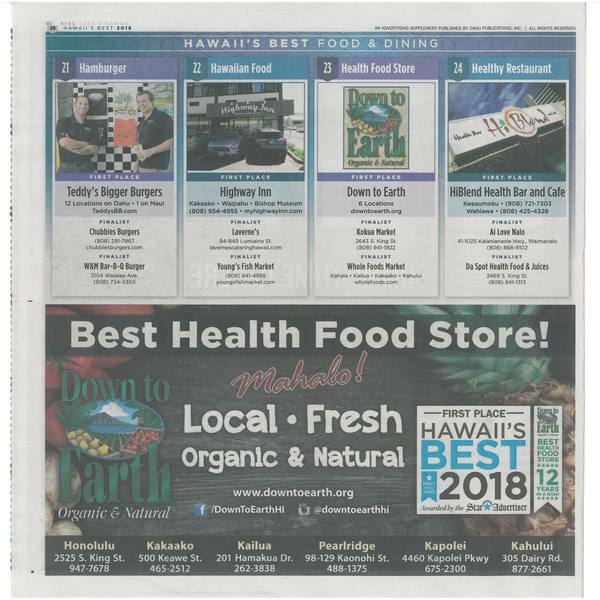 Honolulu, HI (June 17, 2018) -- We are thrilled to report that once again readers of the Star-Advertiser voted Down to Earth “2018 Best Health Food Store.” This year’s contest includes the new Vegetarian category, for which we earned “Finalist.” The announcement was made in the Star-Advertiser’s 2018 Hawaii’s Best edition, which was published on June 17th. As many of you know, this vote is the result of their annual “People’s Choice Awards,” which every year asks readers to name their “Best” choice in a variety of categories. We have now earned First Place in the “Best Health Food Store” category twelve years in a row! The fact that we continue to earn this recognition in an increasingly competitive market makes this news particularly exciting. It reflects the hard work and dedication that each of our team members bring to their service at Down to Earth, and all the things they do every day to help ensure our customers have a great shopping experience with us. Many thanks for your vote of support, and for shopping with us! As always, Love Life! Eat Healthy, Be Happpy!